The vision that God has given Bishop is not just learned, it is experienced. God told Bishop Smith to raise up a people who would praise Him, worship Him, learn of Him, obey Him, and reach the world with the power of His love. He believes that whoever you are, wherever you are, if you are available, God can use you, your time, talents, and your treasure to help change the world. It is his God-given goal to restore broken lives, rebuild families, empower people for change by tearing down traditional thinking and raise the standard of living of the oppressed to a standard of excellence by imparting vision in the minds of people in this region and the world. He has traveled locally and internationally and has ministered in several countries including London, India, France, Africa, and the Philippines, supporting and establishing churches to accomplish this goal. 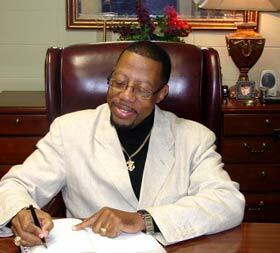 He is the overseer of several faith-based organizations and projects, including Tylertown Neighborhood Resource Council, Blessed Beginnings Child Care, Heavenly Delite Restaurant In & Out Mini-Mart, TFBC Tutoring and Summer Enrichment Program, Youth Pregnancy Prevention Program, Tobacco Prevention Program (SWAT) and a Transitional Housing Program. He is a licensed Social worker and a Certified Behavioral Therapist with a Certified Addictions Specialist endorsement. He was designated as a HIV/Aids Community Liaison Coordinator, providing counseling to inmates, directing a post-release program. His affiliations include board member and faculty fellow for Foundation of the Mid South, and a past board member of Southwest Health Agency for Rural People. He is also a Certified Behavioral Therapist, Certified Addiction Specialist, Licensed Social Worker (State Board Examiners for Social Workers and Marriage) and a Family Therapists. Bishop Smith is a native of Tylertown, Mississippi . Bishop Smith has two (2) children, John and Gweneka. Called for such a time as this, we are honored to have as our Pastor and “set man” of Tylertown First Baptist Church–Bishop Walter J. Smith. Hey! I’ve just stopped by to say thanks for this cool post. Take care!